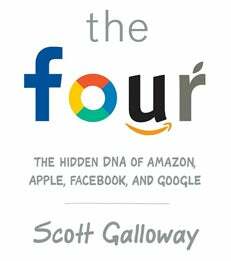 For all that’s been written about The Four over the last two decades, no one has captured their power and staggering success as insightfully as Professor Scott Galloway. Instead of buying the myths these compa­nies broadcast, Professor Galloway asks fundamental questions. How did The Four infiltrate our lives so completely that they’re almost impossible to avoid (or boycott)? Why does the stock market forgive them for sins that would destroy other firms? And as they race to become the world’s first trillion-dollar company, can anyone chal­lenge them? He deconstructs the strategies of The Four that lurk beneath their shiny veneers. He shows how they manipulate the fundamental emotional needs that have driven us since our ancestors lived in caves, at a speed and scope others can’t match. And he reveals how you can apply the lessons of their ascent to your own business or career. Scott Galloway is an Adjunct Professor of Marketing.